This national bestseller exploring the complex emotional lives of animals was hailed as "a masterpiece" by Elizabeth Marshall Thomas and as "marvelous" by Jane Goodall. The popularity of" When Elephants Weep" has swept the nation, as author Jeffrey Masson appeared on Dateline NBC, Good Morning America, and was profiled in "People" for his ground-breaking and fascinating study. Not since Darwin's "The Expression of Emotions in Man and Animals" has a book so thoroughly and effectively explored the full range of emotions that exist throughout the animal kingdom. From dancing squirrels to bashful gorillas to spiteful killer whales, Masson and coauthor Susan McCarthy bring forth fascinating anecdotes and illuminating insights that offer powerful proof of the existence of animal emotion. Chapters on love, joy, anger, fear, shame, compassion, and loneliness are framed by a provocative re-evaluation of how we treat animals, from hunting and eating them to scientific experimentation. 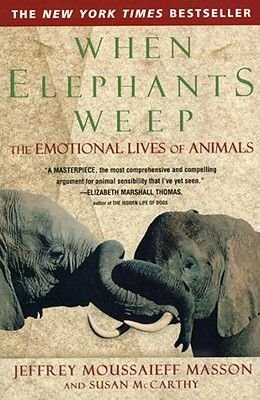 Forming a complete and compelling picture of the inner lives of animals, "When Elephants Weep" assures that we will never look at animals in the same way again. "Fascinating...Compassionate...A book to be read more than once...A kind of nature lover's rendezvous with reality".-- "Philadelphia Inquirer"
"In this impassioned volume [Masson and McCarthy] argue their case with intriguing examples culled from scientific literature...In addition to offering a fascinating array of animals, it convincingly argues that their emotional life is an area worthy of scientific exploration".-- "People"